A few weeks ago, I had the pleasure of interviewing Joanna Gaines for Better Homes and Gardens Magazine online. 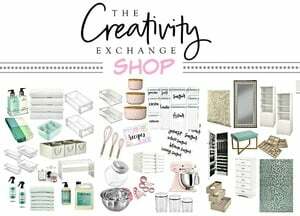 For those of you who may not know, I have been a monthly contributor to BHG for a few years now and it’s been such a fun experience! 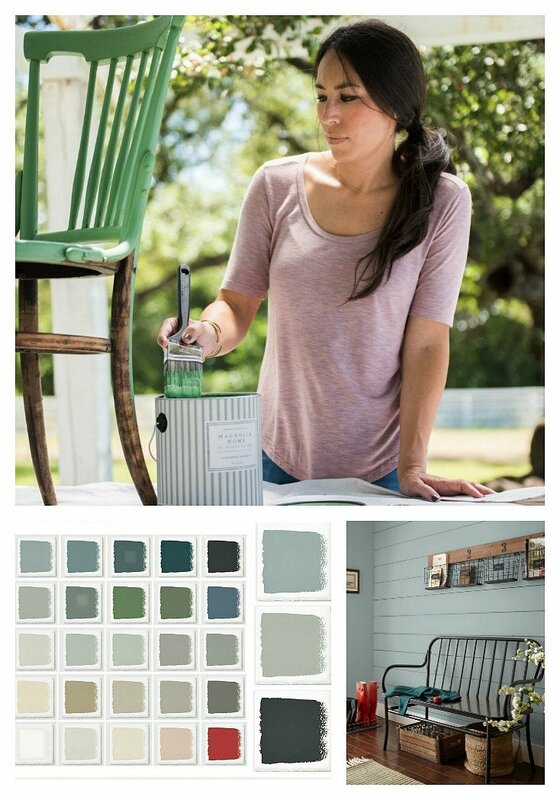 The article I was writing was about Joanna Gaines’ 2018 paint color picks and it was such a joy for me to pick her brain about my favorite subject (paint colors) and find out her thoughts on where she thinks we’re heading in color in 2018. Joanna (especially for me) is so inspiring when it comes to her color (and design) selections and getting a sneak peek into what colors are inspiring her heading into 2018 is so interesting to me (and hopefully to you too). My article is now live on BHG here and I am so excited about it! I hope you guys will check it out but come back after reading it because I really wanted to add some additional observations/images/colors that I didn’t have enough room to include in my BHG article. I also wanted to share some interesting things with you guys that I picked up on with Joanna’s responses. One of the most insightful things Joanna told me in the interview was that she felt like 2018 was going to be the year of contrast and I couldn’t agree with her more. Soft neutral wall colors paired with bold statement colors in fabrics, rugs and accessories is one of the hottest trends that we are seeing right now. In fact, for those people who are unsure of how to layer and decorate their home, decorating with contrast is the easiest way to layer a space. If you have light neutral walls, layer your accessories with pops of bold colors. If you have a dark accent wall, contrast the space with light layers in rugs and textures. It’s that easy! Joanna mentioned in the interview that she is still very much grounded and drawn to neutral paint colors, which of course is no surprise because nobody layers perfect neutral paint colors with pops of colors as well as Joanna. 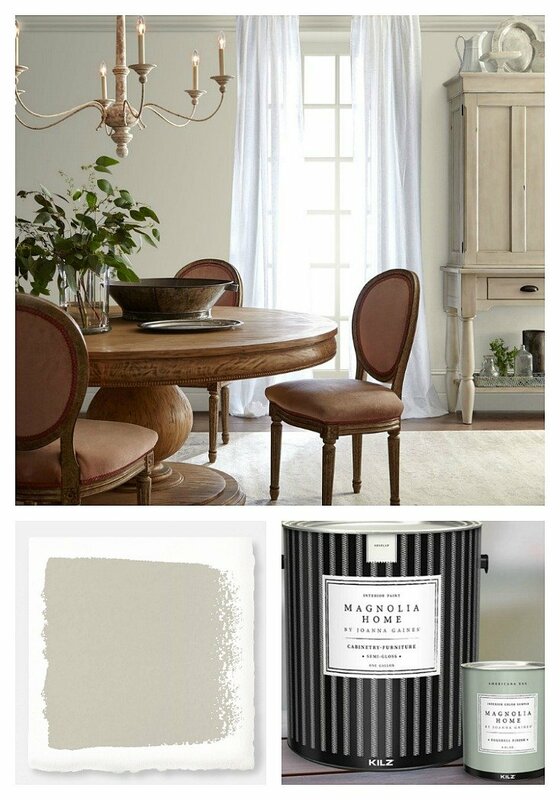 In fact, her love of rich beautiful neutrals is strongly supported by the color selections in her Magnolia Home paint line in partnership with KILZ. Just look at all these great colors. 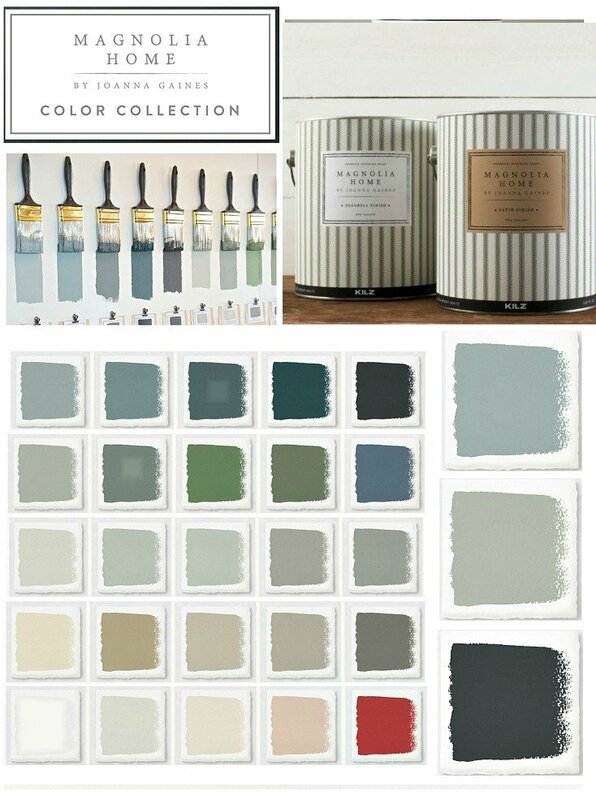 Of course, Joanna has expanded her Magnolia Home paint line to hundreds of colors that she personally developed. I love that even some of her bolder colors are still transitional colors (balance of warm/cool tones) that will work with everything. 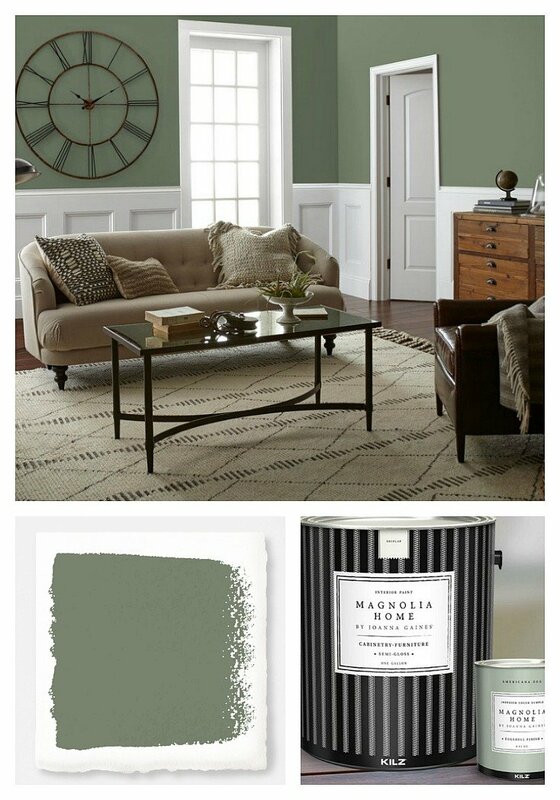 So back to the neutrals… Joanna often mentions the color Garden Trowel as one of her favorite neutral paint colors and in fact, she also mentioned the color multiple times (in the interview) that she will be using more of in 2018. 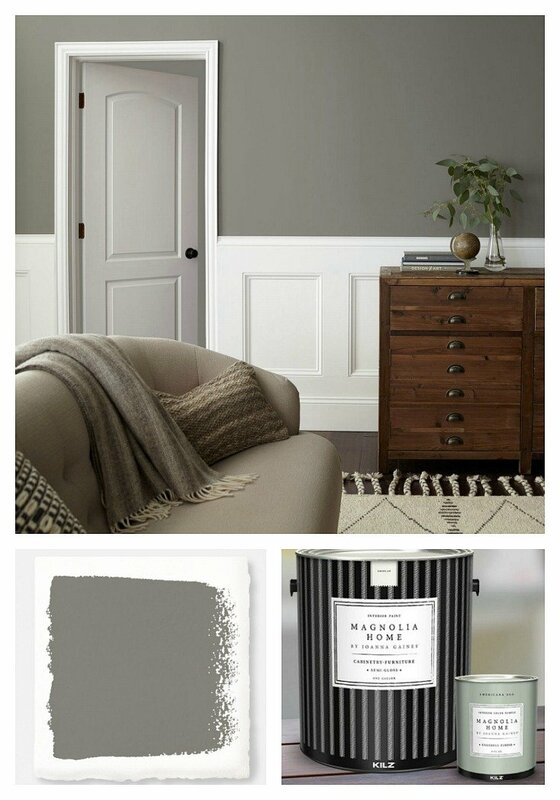 I love this shade of muddy gray and again, it’s a fantastic transitional neutral because it has that balance of warmth/cool undertones. Grays can go cold and sterile very easily and all of Joanna’s neutrals have that balance that ensures that the color will work well with other colors and tones in a space. Gatherings is one of my favorite colors from Joanna’s paint line and while it’s another great neutral, it’s also light, airy but not white. I love a little color on my walls and Gatherings is a fantastic color to let beautiful wood tones be the star of the space. Throughout the interview, Joanna talked a lot of about drawing inspiration for organic sources like plants, wood and nature. This is no surprise because if you following along with her HGTV show Fixer Upper, you see organic elements in every Chip and Joanna renovation project. In fact, Joanna has the nickname “plant lady” because she loves plants and is so inspired by greenery and organic elements. Joanna mentioned that she felt that organic colors like Olive Grove are really inspiring her right now and she’s looking forward to incorporating more of these colors inspired by nature into her projects in 2018. 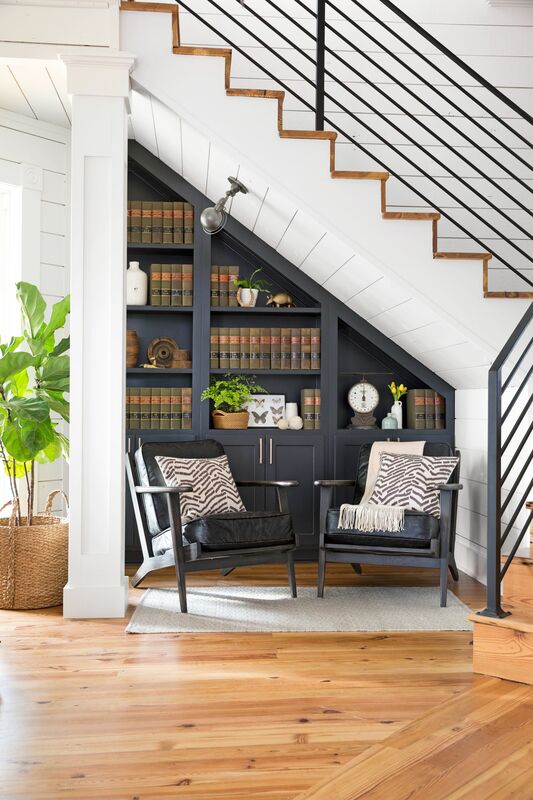 I wanted to add that I have noticed in the last couple of years how Joanna has incorporated more wood tones into her projects (wood beams, antique wood doors and natural wood accent walls) and contrasting with whites. In fact, this is a big trend that I have been noticing in the last six months and feel like Joanna really inspired others with this design trend. By creating a very light and white neutral foundation in a space, the wood tones become the star of the space architecturally, in color and texture. It’s really a very smart way to show of the bones of a space and add character. 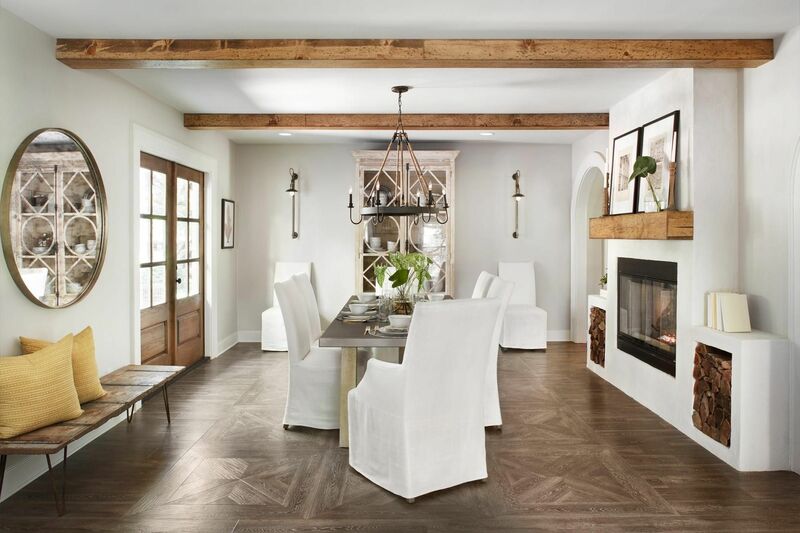 In this space below from Fixer Upper season 5 (episode 3), Chip and Joanna took an otherwise small dining room with a lower ceiling and used natural wood to create more architectural elements (beams, mantle, doors, floors and table). The white foundation makes the color of the natural wood the focal point. The white used throughout also helps to keep the wood from being too busy. Joanna also talked quite a bit in the interview about how she is very inspired right now with bold statement colors. She made a point to tell me that while she is known for her use of neutrals and whites, she is also very drawn to bolder colors and tries to find ways to incorporate those colors into her projects. Weekend was another color that Joanna mentioned multiple times. In fact, she told me that she is really drawn to to deep, moody hues right now and that she and Chip have gone through so many gallons of Weekend this season, which is a denim-inspired blue. Blackboard was another color that Joanna specifically mentioned that she is loving right now and planning on incorporating into more of her projects in 2018. Joanna told me that she felt that pastel colors are having a “moment right now” as we head into 2018. She said that one of her favorite lighter pastels is a color called Rainy Days. 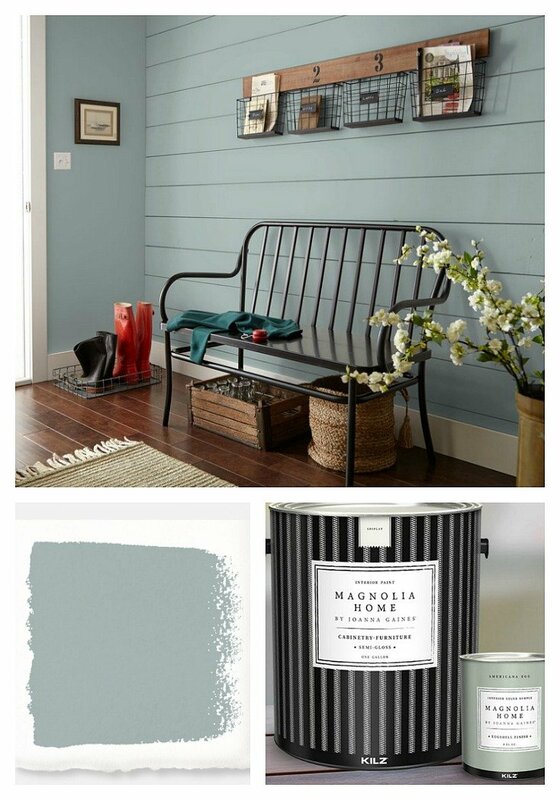 I was really excited for her to mention this color because it’s hands-down my favorite Magnolia Home color. I have recommended it for a client project that turned out so beautiful! 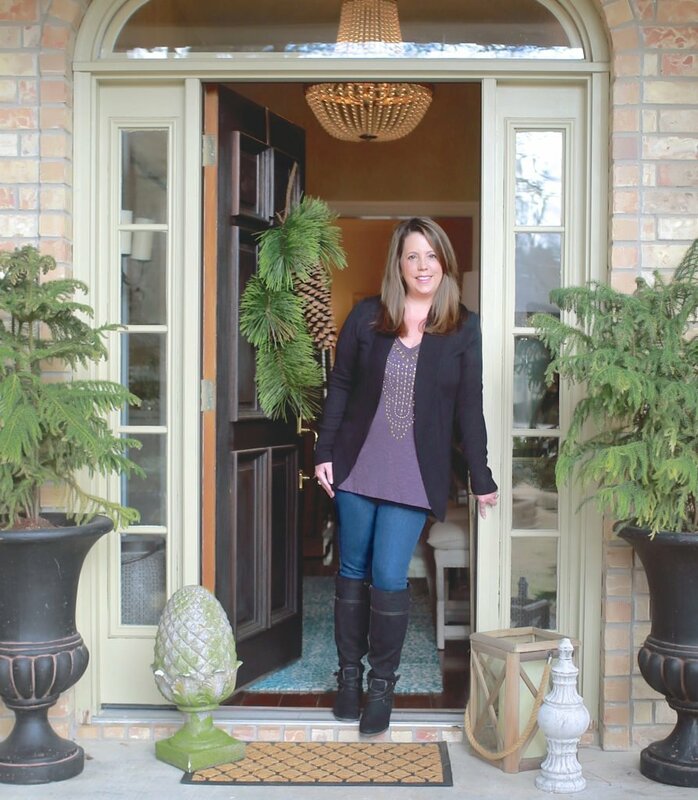 The one common thread that I found with Joanna whether in my interview for BHG or during my time visiting with her last year in Waco is that Joanna is always striving for timeless design and colors. While she may venture off into bolder accent walls or kitchen islands, her colors will always be transitioning colors (balance of warm/cool undertones) and those are the timeless because these colors just always work. 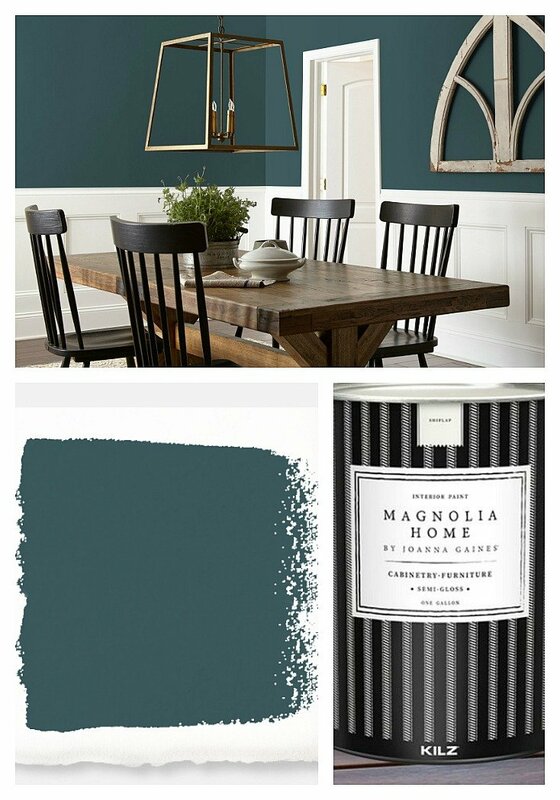 If you haven’t had the chance to try Magnolia Home paint, you should. 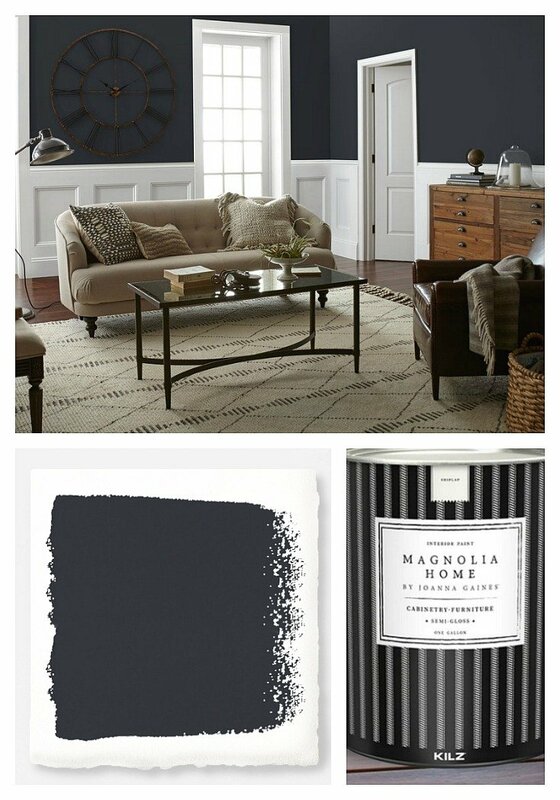 It’s a fantastic product that I love and I also love the Magnolia Home Chalk Style Paint. If you want to find out more about the chalks style paint, I wrote a blog post about it here and my experience going to Waco to paint with Chip and Joanna. Thanks so stopping by today friends! I love Fixer Upper and Joanna’s decorating ideas. Great interview! ……….so proud of you! Very exciting that you were able to interview Joanna. Thanks for sharing. Congrats! Any chance you know the paint color for the image above of the Season 5, episode 3 dining room with the wood elements? I can’t wait to see the colors in person! My creative wheels are spinning!!! We bought a house in March 2018. The whole house was painted inside a meadow breeze green, carpet is a shade of green too. I didn’t touch the color until I knew what I fell in love with a neutral tone. Gatherings was the first color I fell in love with. It blends well with my furniture. Thank you Joann Gains. Rainy days- can that be translated into another carrier like Sherwin Williams paint line? Or Lowe’s? I went to SW today and they’re not sure which one this could be. Hi,lam trying to pick a color for my bedroom walls.I have turquoise curtains and comforter in my bedroom.So what color would be good to put on my walls? Any suggestions,please help!